As a parent, grandparent, alumni or other supporter of St. Philip the Apostle School, you know the value of a Catholic grade school education. Numerous studies show that students from Catholic schools are more likely to attend and graduate from college, earn higher wages once they are in the workplace, and actively participate in their church and community as adults. 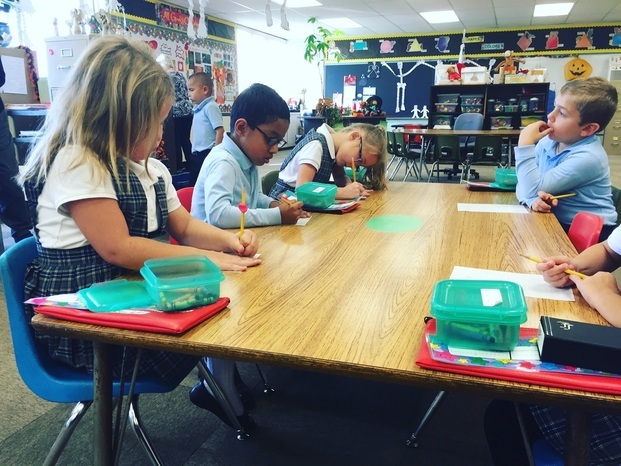 At St. Philip the Apostle School, we know the path to success starts with the challenging, yet nurturing environment that our students experience every day. Our goal is to give children the tools and skills that will help them succeed in high school, college and beyond. You may not be aware that tuition covers only a part of our operating costs. The remainder is subsidized by the parish and through fundraising programs like our Annual Fund. The money raised through this appeal gives us to the flexibility to address areas of greatest need within our curriculum and day-to-day expenses. Last year, generous parish and school families helped us raise $12,035. This year, our goal is to raise $20,000. Will you help us by donating to this year’s Annual Fund Campaign? A small donation of just $30 will help us achieve our goal. That’s approximately the price of five coffees at Starbucks, or a quick meal at a medium priced restaurant. Skipping that coffee or restaurant meal and donating the money to St. Philip the Apostle School will help us provide better facilities, programs and services to our children, positively affecting them for the rest of their lives. Your generous donation will be recognized in our Annual Fund Report and other school publications. Here’s how you can double—or even triple—the value of that $30 donation! Did you know that many employers sponsor matching gift programs and will match charitable contributions made by their employees. Some companies even match gifts made by spouses or retirees. Ask your employer’s human resources department if it participates in a matching gift program.